Fuchsia is well known for its beautiful flowers; however, fuchsia berries are also an important component of the plant, and can be consumed. Fuchsia can be easily cultivated in a wide range of environments; it is not only a colorful, pretty addition to any garden, but also a useful medicinal herb. 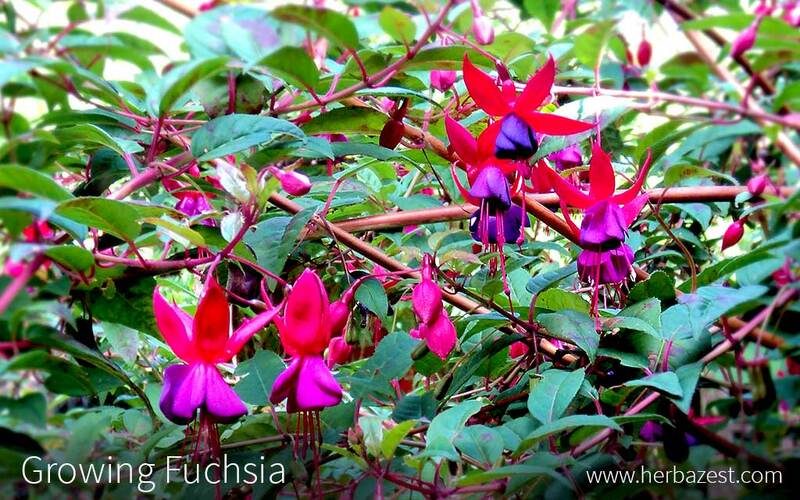 Fuchsia can be grown across the world as long as it is subjected to the right conditions. Without adequate temperature and access to water fuchsias are likely to suffer. Learn all about how to grow fuchsia with these easy growing guidelines and succeed in the cultivation of this showy flower. Fuchsias can survive in a wide range of soils: chalk, clay, sand, or loam-based. The soil should be kept moist at all times, but it needs to be well-drained; otherwise, the plant itself will stay wet, which is likely to lead to disease and rot. A pH of 6.0 or below is ideal for growing fuchsia plants. Fuchsias prefer cool temperatures of 60 - 70°F (16 - 21 °C) during the day and around 10°F (-12°C) or lower at night. Direct sunlight and high temperatures can be harmful to fuchsias, as they grow best when protected by partial shade; if the average temperature rises above 76°F (24°C), fuchsias won't grow flowers. However, if the weather is cool enough, full sun will be fine. It also should be noted that while this plant prefers cool weather - especially during early spring nights - when the flower buds are developing, it is also sensitive to frost and should be guarded from extreme weather conditions. Seeds should be planted in individual pots and kept in a greenhouse until the plants are large enough to be moved outside. They can then be transplanted in late spring or early summer - when there is a no risk of frost. The seedlings can be planted either in hanging baskets, flowerbed containers, or into the ground. When growing fuchsias from cuttings, they should be planted about two inches (5 cm) below the soil surface. If the weather is cold, the surrounding soil should be covered by a layer of organic matter in order to protect the roots from possible frost. The plants should be watered regularly and protected from high temperatures as much as possible. Aside from at the beginning of growth when seeds should be cultivated in a greenhouse, fuchsia plants are best kept outdoors until the weather becomes too cold. When this is the case, plants should be brought inside to a cool area where they have access to ample light. For this reason, it is perhaps advisable to grow this plant in a portable container that can be moved as required. Care should be taken to ensure that the plant receives enough water while it is inside, as under warmer temperatures, the soil will dry out more quickly. This an important part of fuchsia plant care. Fuchsias are thirsty plants, and growth stall will occur if they don't receive enough water. It is particularly important in warm weather to provide them with plenty of water every day. However, it is also necessary for the flowers and leaves to dry adequately in order to avoid disease and rot. To achieve this, the plants should be irrigated in the early morning so they have all day to absorb the water and dry. To encourage and stimulate steady growth, a monthly application of fertilizer - especially during the summer - will be highly beneficial and may also extend the flowering period. A liquid seaweed fertilizer is suggested to prolong the life of the flowers. Alternatively, a granular, slow release fertilizer can be less frequently spread around the fuchsia plants before watering. Fuchsias benefit from some annual pruning. This should not be carried out in winter, as frost is likely to cause damage to the newly-exposed areas, which will inhibit regrowth. In early spring, any dead or weak areas of the plant should be removed, and the flowering stems from the previous year must be cut back. While this may result in the shrub being reduced to almost ground level, it will stimulate strong regrowth and encourage flowering in the year ahead. Unfortunately, it is fairly likely to see weeds growing in the vicinity of fuchsias. Since some weed-killers can be too harsh and may damage the plants, the most effective method of dealing with weeds is to remove them by hand. It is important to be aware of the various pests and diseases that can affect fuchsia plants. Unfortunately, there are many sorts to consider, but knowing what to look for means that the problem can usually be dealt with before it spreads. While fuchsia is in a greenhouse, common pests include whitefly, red mite, aphids, leafhoppers, thrips, and vine weevils. When it is outside, the main threats are caterpillars and the capsid bug. All of these can usually be deterred by using a natural or synthetic insecticide. The fuchsia flea beetle is also regularly found on the plant. These are small, black-blue bugs that are most active between April and September. They feed on the leaves, which causes holes or brown patches. Insecticides are effective against these pests; however, it is important not to use these while the plant is in bloom, as the substance will harm pollinating insects. Another pest that attacks fuchsia plants is the gall mite. Only 0.25 mm in size, it is not visible to the human eye, but extracts sap and secretes chemicals that inhibit the normal development of the plant, so an infestation becomes apparent when leaves and stems are obviously discolored or deformed. Unfortunately, these mites are tolerant to most pesticides, and the only way to get rid of them is to remove the affected plants. A frequent disease found on fuchsias is rust. It is usually found on outdoor plants in summer and early autumn, but can exist on indoor plants all year round. Rust causes patches of discoloration and worsens the health and strength of the plant. Affected leaves should be removed, but it is important to catch it early because if too many leaves are cut, this in itself is likely to stunt the plant's growth. Fungicides to tackle this condition are available, but they should not be used if fuchsia is intended for consumption. Ensuring that the leaves and flowers of the plant are dry should help prevent this disease. Various birds and rodents are known to feed on fuchsia plants, as they are particularly attracted to the berries. Some deterrents are available to buy, but their effectiveness is disputed. It is suggested to place a muslin bag over the berries in order to protect them from birds. It will also help catch the berries when they fall off. When the plant flowers in the summer, berries will also appear. Fuchsia berries should be harvested when they feel somewhat spongy. The flowers should also be harvested in late summer, when they have grown to their fullest. The other components of the plant can be picked when desired; however, if the whole plant is removed, it will not regrow. To avoid losing the plant, it is advised to cut it back to around 8 - 12 inches (20 - 30 cm) above the ground. In order to benefit from all the medicinal properties of fuchsia, it is advisable to consume it as fresh as possible. However, there are ways to preserve the plant for later use. The components of the plant can be dried in a warm environment for at least eight hours, and these can later be used for tea. Alternatively, the plant can be crushed and then added to an alcohol to produce a tincture, which must be diluted with water in order to be consumed. This will keep the healing properties of fuchsia alive for a prolonged amount of time. The crushed plant can also be infused into a carrier oil, which can later be used to make an ointment or salve. These preparations will also keep for a good length of time. Following these easy guidelines, it's possible to grow, harvest, and store fuchsia at home. From its many medicinal properties to its showy flowers, there is a lot to gain from cultivating this useful and ornamental plant.